I have used an Opinel a fair bit and it has become a favorite folder since it was given to me last year by a friend on this forum. It's light weight and easy sharpening blade makes it my choice for carrying in my bib overalls. After watching most of this video the one I have is the right size for me. Up a size would probably work okay too. The Opinel works very well with food preparation at the campfire and for any simple cutting task you have. I probably cut baling twine off of 100 round bales with it last year. It isn't as robust as a Buck 110 but I skinned one deer with it just to see how it worked and it did just fine. +1 / Ditto....on the knives... but unlike wsdstan, I only used it for small game & birds (#8). The Opinels ( Since that is all I own of this type of folder, speaking of the # 6, 8 & 10 , but I gave away the 6 as a gift as it was too small for my hand & uses...), they seem to be quite an adequate folder with many uses. I would only say that a person might want to "seal" the wood a bit better than the "stock" condition, if they want to do any food prep or animal processing. That would be my only concern. The first thing I do with any Opinel is soak it in a 50/50 mix of boiled linseed oil (or Teak oil) and odorless mineral spirits for 24 hours in hot weather. Dry it out for a few days and it will never stick again. The wood still breathes between humid and dry times but it never does get too loose or too tight. The 12c27 steel holds an edge longer than my carbon models and takes just as fine an edge. It will carve wood like crazy and the nice thin, full convex blade really slides through all manner of veggies and foods. Perfect camp and travel knife for me. I usually pair it with a Mora for a cutting cutting tool selection with super low weight. Purchased a #8 stainless in june ( I think), it is a good work knife. Use it for cutting pipe insulation, boxes, and scoring drywall. Keeps a good edge, easy to sharpen, all around a good knife. Highly recommend. Sounds like an excellent choice as a pack knife. The OPINEL #12 is my favorite. The grandson of the founder speaks directly to me when ordering. Discounts for larger orders too. These knives are not stored in warehouse surplus but rather produced upon request by batches of steel in runs. Customs agents make the shipping slow and expensive to USA. The problem is the bezel pops off if opened in a locked position. This happens in low lighted places or at night when the bezel is not seen well. I got my first Opinel over the weekend. Vendor at the local gunshow has good bushcraft gear at good prices and he just started selling Opinel. Picked up a No 6 and it does everything I imagined it would do standing there as I played with the different sizes. Being so thin and easy to get for real razor sharp it will make the finest pile of fat wood shavings you will ever make, and quick. It's well worth the small price. I see more in the future. A longer bladed one will make an awesome folding filet knife. The #6 is my wife's favorite, also. I'm partial to the #8 just because it's a mite bigger than the blade on my SAK.......and it fits the plier pocket in my bibs perfectly, too. I looked at the 8 and liked how the 6 felt in the pocket and that mite bigger size for me wouldn't mean much for what I see myself doing with it. That is one thing that impressed me though. You can't say I wish it was a bit larger or a bit smaller, they have that covered. Is there any American made Opinel type knife? That is a real fine carry knife, a super knife that weighs one ounce. Here is my #6 in Bubinga wood soaked in Teak oil for 24 hrs. Water does not affect it at all now. The blade slides through things like a laser. Not currently. I think Cold Steel made something along that line at one time though not with a wooden handle, but no longer in production. Opinels are the real deal, a very useful knife for the traveler and farmer, a real working knife. Nothing cuts quite like an Opinel. That looks great. I would have never thought this knife was such a worker and you can not judge this one by the way it looks. It is a worker. What impresses me is I was expecting the edge to roll or chip or something being so thin. I've done a good bit of work with it so far and other than staying sharp the edge is not getting any damage. Really don't know how such a thin blade don't roll the edge. I'm not easy on it but I don't think it will pry into zip ties very well lol. Best part is it fits into a Schrade LB5 leather pouch perfect. I have been carrying my #7 the last couple days. Thinking about getting a #6. I found this sight . From what I see the #6 weighs in at a hearty 1 oz. I might mod it a little but nothing like in the link. I have used mine mostly as a paring knife in the kitchen and for eating meat at picnics or outdoor affairs where they give you crummy plastic knives. It is, for the money, a terrific knife with a great slicing blade and so easy to sharpen it makes me think I am getting good at it. I purused the site with the Opinel mods but only saw a couple I liked. A couple of those fixed blade Old Hickory knives are pretty good. I've seen and handled a lot of Opinel mods in my day, but the way I see it, you can't improve on perfection. 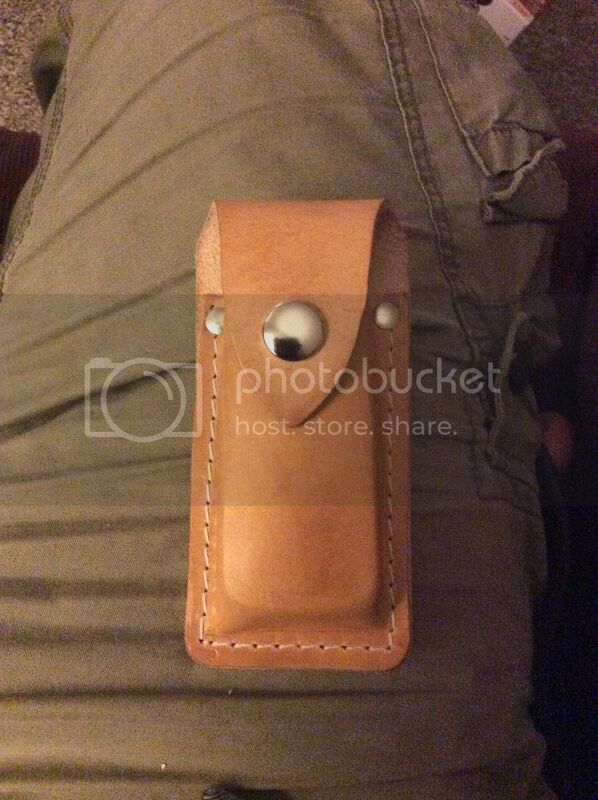 I ordered a belt pouch for it today. I thought it was just the pouch but when I read the description after I ordered, it comes with the knife and pouch. Looks like I will be getting another one, this time in carbon steel, same No. 6. Got the belt pouch, and a carbon steel No6 with it. All I wanted was the pouch. The carbon takes a much finer edge. I thought the Inox was razor sharp. The carbon steel blade is like a laser. Now I have two users. I know I'm preaching to the choir but the Opinel blade is ground like a full width Scandi bevel. There is no secondary bevel on the cutting edge. Most of the time, you just need to strop this blade. If you put a secondary bevel on it like a traditional American made knife, you will dramatically reduce its cutting efficiency. If you must stone it, lay the blade flat on the stone and gently push it along for a few strokes. Then flip it over and do it again. You COULD call them 'flat,' but technically Opinels have a spine to edge convex grind......it's very shallow, but if you look closely, it's there. I have checked all of mine (6 of them in total) three carbon models and three stainless models and all of them are fully convexed in their geometry. They will not lay flat on plate glass but rock a little. The best way I've found to sharpen them is dragging them on fine grit sandpaper over a mouse pad. Then gently lift them for a few strokes to strop off any wire edge. Good edge holding and laser sharp. I got both scary sharp by simple stropping on some old cut up leather belts glued to a board with automotive valve grinding compound on them. A harder leather belt removes more and a softer leather belt polishes to unreal levels. The carbon steel version takes a much more fine edge, if that's possible because the Inox is just too sharp and I've been doing lots of cutting with it. It doesn't feel like it's cut anything and still no rolls or chips or dents. I imagine the carbon will hold its edge even longer. I plan on carrying the carbon and stashing the Inox in the pack. No argument about the convex grind. I only wanted to point out that there is no secondary bevel. If you were to use a sharpening jig like a Smith or Lansky, it might mess up that nice cutting edge. 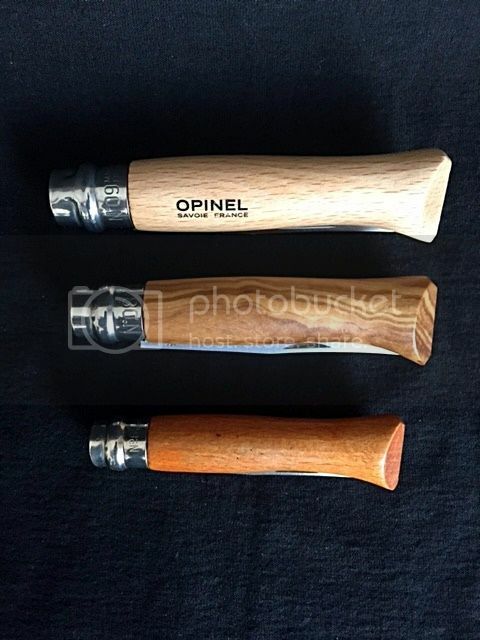 I think My Opinel wood has swollen (probably fom oil applied to the the blade) and it is difficult to open. Anyone have a cure for that? You could try drying it out in the oven or dehydrator on the lowest temperature. If you've oiled it, it'll be unlikely to crack (and the wood is well dried previously regardless). I always modify my Opinels. I drop the point till it's almost a spear point. I then sand down the whale-tail: sand off the fin on the slot side and round out the other fin. I'll post a pic in a little while. I sand the whole handle and then treat as an axe handle: some wipes with linseed oil then run with wax. I gently heat it to smooth the wax and let it soak in. I'm on my forth No. 8 now. A carbon when I was a teen, an Inox for Christmas a few years ago from my BIL another Inox in a trade and my current one. Funny thing about me and Opinels: they're the only knives I seem to lose. Heck, I still have a Vic SAK from '84. Wonder why I lose these? Yeoman, maybe because they are so light and small, you never notice when they are no longer in your pocket? And, they all have a tendency toward tadpoleitis. They grow legs and walk off. That's why I ordered a leather belt pouch. So I won't lose it. Ended up coming with the knife too. Was actually cheaper than buying the knife alone. The extra No.6 is a bonus. Boris, I see two knives in your photo but no sheath. I think the 6 will be my next one. I have 2 of the 7. I think My Opinel wood has swollen (probably fom oil applied to the the blade) and it is difficult to open. Anyone have a cure for that? Sure do. Pop off the lock ring and put it in a small jar filled with Watco Teak Oil on a hot day and leave it in there for 24 hrs. I use a little olive jar or perhaps a little caper jar for the #6. After you take it out wipe it down dry over and over, get down in the crevices with toothpicks pushing pieces of paper towels and clean off the blade with alcohol, then let it cure in the sun for a couple days, wiping it down a few times more. Put the lock ring back. Swab a little Vaseline in the joint after a week and do that ever couple months. Mine has never swollen again. I drill out a lanyard hole first using my drill press and getting the handle precisely aligned, backing it good so there is no tear out around the hole. Lightly sand the sharp edges and after the Teak Oil treatment make a lanyard and you can attach that to a leash & clip. I make mine so it will hang vertically in my pocket and barely touch the bottom. It rides much better than laying in the pocket's bottom sideways. Nothing fancy. Just like the knife. That's a nice piece of leather. The sheaths I have seen are just open top pouches. Yours should keep it safe. I went to take a pic of my modified Opinel last night and can't find it. The first of 2 Opinels I ordered arrived today. My current Opie is a No.6 and is just a bit small. I ordered a No. 8 with olive wood and carbon and a No. 9 with beech wood and stainless. The No. 9 came in today and frankly, the stainless blade was none too sharp. The edge was slightly rolled. I have stropped it to where it will shave hair but it does not feel as grabby as the carbon steel. One the plus side, the No. 9 is a nice handful with a 3-3/4" wood grip and a 3-1/2" blade. Update: the No. 8 olive wood arrived but was also in stainless. No problem. However, it aso had a rounded edge but 10 minutes of stropping got it hair-poppin sharp. These are both excellent knives for the money. The No. 8 is about 1/2" shorter than the No. 9 but still comfortable in the hand. Both had a new feature; a cutout on the bottom of the rotating ring that locks the blade closed. Good feature but it will take time to get used to it. Note the feature to lock it closed. Well, I can't figure out how to fix the problem with the photos, sorry. Well I can see them. The olive wood handle is pretty nice. I think PB is having a problem right now. Don't think it's anything to do with your account or how you linked the pics, QC. Bunch of photos on here and other forums that I can't see right now. I think you're right, nuke.....I haven't moved any of the photos in my account and pictures I've posted here are no longer visible, either. I was cruising around the net this morning and ran into this unusually accurate review of the Opinel knife that ALMOST all of us know and love. Pretty much my exact feelings, but no one ever mentions the fact that the blade/handle joint never seems to get any sloppiness or play in it which I figured would surely occur eventually, but never does. That is a good review of that model. He forgot only one thing I care about....... it fits nicely into the chest pocket of my bib overalls. Just perfect in fact. I used one to do chores at the farm over the last year or so. Cutting baling twine when feeding big round bales to the cattle, cutting the tails off of Raccoons we harvested, as a scraper now and then, and an all around lightweight knife. I need to spend more time with it in starting fires, making feather sticks, and so forth. A friend gave me my No. 8 and I am indebted to him for acquainting me with the brand. I also have a No. 10 found at a gunshow for $4 if I remember correctly. The 5 remains my favorite Opinel though. I may be mistaken, but I'd almost be willing to bet my last nickel that your friend who gave you your first Opinel gave you a #8! I was typing without my reading glasses. I am unable to remember schitt even though the knife was right in front of me. Take your pick of the above. The correct answer is the first one. A couple of my Opies were a bit stiff to open. I found a vid on YouTube that showed how to fix that very easily. But you have to disassemble the knife to do it. If you have a set of pliers to open retaining rings, you can do it in minutes. Open the chromed barrel with your pliers. Slide it off. The pin that the blade rides on is upset on one end so gently pound it out with a small punch or nail from the other end. 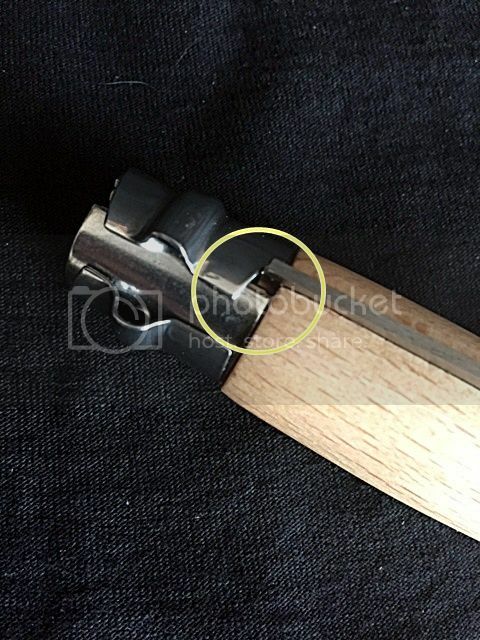 The pin is bent slightly so pay attention to the direction of the bend relative to the hole in the knife. The hole is slightly off center. Gently sand the pin until the blade moves freely on it. Now re-assemble the knife and you are done. During our stay in San Antonio, one of our nieces & her new husband invited us to their home for a steak dinner. As we took our places at the table, I couldn't help but notice, what appeared to be the familiar outline of the Laguiole folder at each place setting. Upon closer inspection, I discovered that they were one-piece, non-folders that were very nicely finished.....and sure 'nuff, the Laguiole trademark was stamped into the side of the blades. They were FINELY serrated, which I like for their propensity to slice without ripping the steak edges to shreds. They received them for a wedding gift and had never heard of them before so, naturally, I filled them in.......ad nauseum! I have seen photos of the fixed blade knives but never saw one in person. 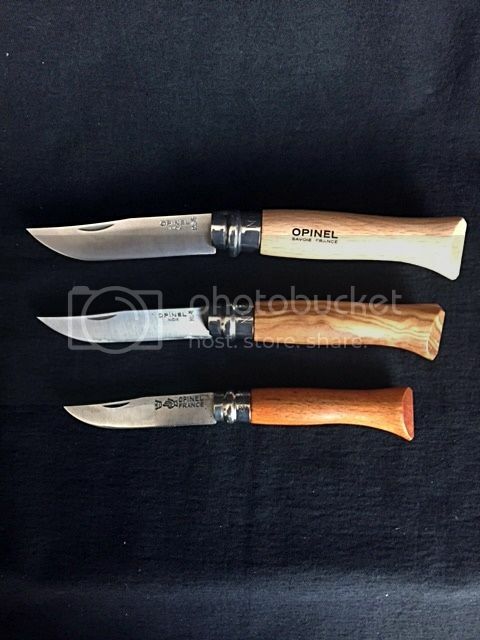 Since you mention Opinel knives. Mine has become so loose at opening and closing that you cannot use it without turning the locking ring. Now it is so loose you have to turn it very hard or it will might turn to the open slot. I searched for and found ways to tighten up these things but they didn't work to well. What should I do? I could make it into a fixed blade I guess, would not take much to do that. After I typed this I saw another post in the thread of how to loosen one up. I will just do that. If you can't get it back to 'normal' again, let me know & I will send you another one. Thank you, I will let you know if I need one sent. Humidity in FL keeps the Opinels tight. Just a thought. Gotta change my post from what I said Tony, I went and got the Opinel out of the chest I keep knives in. It is as tight as that proverbial bull at fly time. It surprised me as I had soaked it in a bit of water but had read a couple of test results on that method. In this case I soaked it a week and that was two weeks back. Now it is tight. It wasn't when I put it away but now it feels normal. Nice topic :-) I have an opinel 7 for in my foodbag, an opinel 8 for occasional backup knife, and a laguiole as a edc pocket knife. 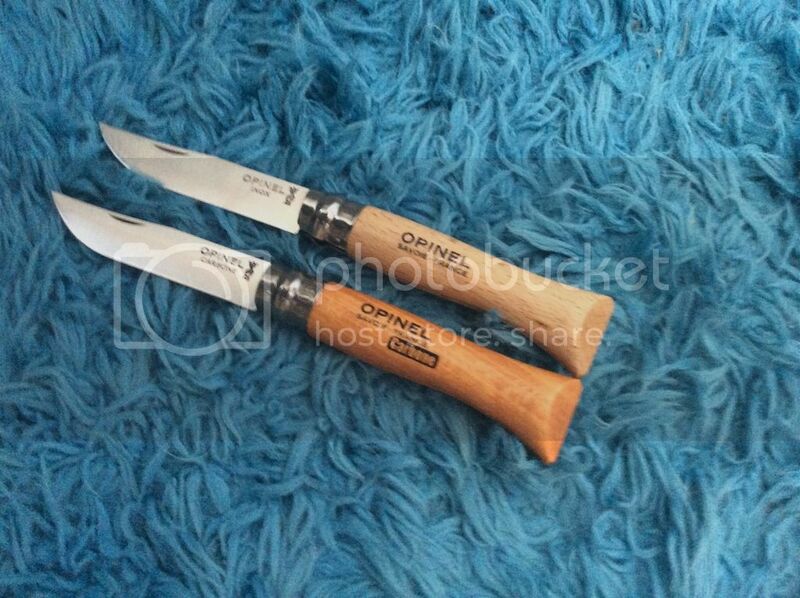 And last but not least the opinel folding saw, great little saw!